Voted "Best Deli", "Best Sandwich" and "Best Lunch"
Voted "Best Sandwich" and "Best Deli"
Voted "Business of the Year 1990"
100 Mile Meals featured Zoccoli's. Check it out! Everything we serve is prepared in our very own kitchen, on the premises. We make our soups and sauces from scratch. 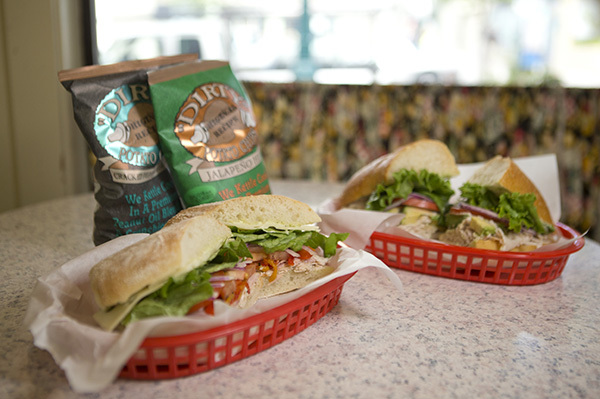 Our sandwiches are piled perfectly with the highest quality meats and ingredients available. We roast our own turkey and roast beef and make our own hummus and tapenade daily. Even the avocados are sliced fresh for each sandwich. What’s the secret to our great tasting artichokes and mushrooms? We marinade them ourselves. Our all natural breads are baked fresh daily just for us by Golden Sheaf Bakery. All of the salads in our deli case are also made fresh, from scratch, daily. And, we have the most authentic Italian tiramisu available...our own secret family recipe. It isn't unusual to see customers in our deli whose parents and grandparents shopped at Zoccoli's Deli for decades. The feeling of nostalgia for old family Italian cooking is guaranteed when you take a bite of our Meatball Italiano sandwich or our hand made lasagna or sip our Vegetarian Minestrone soup, Nonni’s own recipe. The Zoccoli family is in the deli every day, making your sandwiches, preparing your lasagna, creating your deli tray, and welcoming you as you arrive. 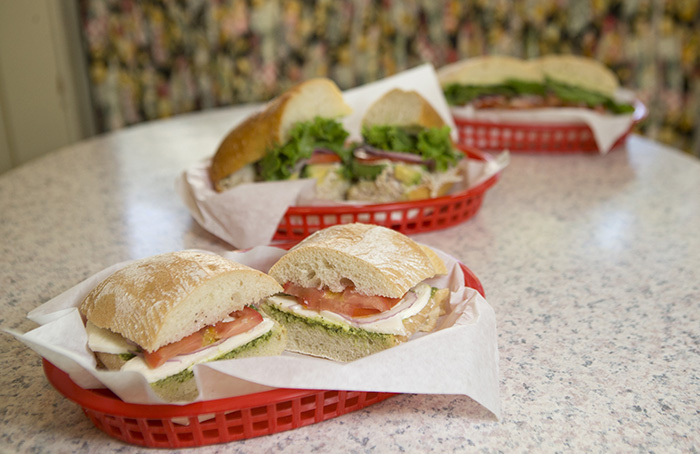 The Zoccoli's Deli staff has been serving Santa Cruz locals and visitors for 4 generations now. You know that old world charm you'd expect in an Italian family deli - friendly, personal, caring, and proud of its outstanding reputation? You'll find it here, carrying on the tradition of service and value to our community. What should I order if I want to feel like I’m sitting in my Italian Grandma’s kitchen? The Meatball Italiano or our raviolis are guaranteed to make you feel like you’ve been transported back in time to a little old Italian village where you can practically smell the marinara simmering on the stove. Can I bring a date in for a romantic lunch? Nothing says “Romance” like sharing a perfect bottle of red wine, a fresh garden salad and sandwich (hold the onions), followed by fine imported chocolates for dessert on our lovely patio. If the date goes really well, you can take home some ravioli and another bottle of wine to enjoy together for dinner. 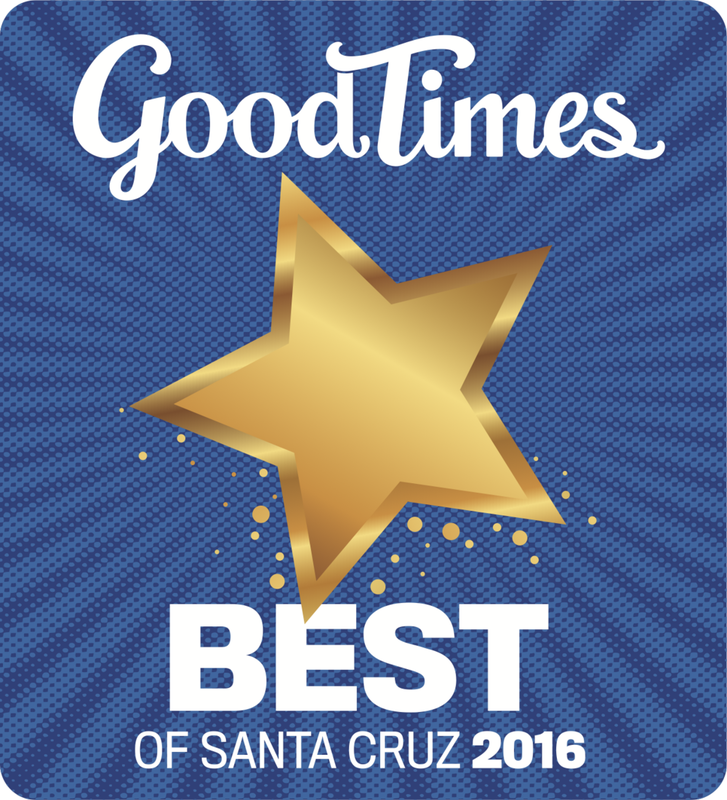 What’s the best way to soak up the magic of downtown Santa Cruz? Our patio offers some of the best people watching available in town. Order from our assortment of handcrafted micro-brews, paired with a couple of scoops of our freshly made salads, and enjoy the show. It’s Meatless Monday, I’m also vegan, and gluten free, and hold the dairy. What should I order? Not only do we have vegetarian choices for sandwiches – just think of all those fresh veggies and marinated treats and roasted eggplant that we make fresh – but our soups and raviolis are also great for the non-meat-eating crowd. Come on in and tell us what you like and don’t like and we’ll offer up an abundance of vegan and gluten free options as well. It’s not hard to do when we make so much to-order! Besides our award winning sandwiches, what’s the one thing I shouldn’t miss when I come to Zoccoli’s Deli? People have told us that we have the best pasta sauces they’ve ever tasted. Our Tiramisu is beyond amazing as well as our selection of other homemade desserts (think blondies!). But our Deviled Eggs are fantastically special. They are simple and delicious and we have customers who come in just for our eggs on a regular basis. Also, don’t forget to grab a salami or two delivered directly from Molinari Salami in San Francisco. I’m planning an afternoon at the beach, what should I get to-go? Nothing beats a picnic on the beach. Warm sand, cool breeze, sounds of the Pacific Ocean at your feet. Swing in and pick up an assortment of our packaged salads, antipasti, some cookies, and old-fashioned soft drinks. Spread out the picnic blanket and enjoy a perfect afternoon. Oh, and don’t forget the Deviled Eggs! In March of 1948, Robert Zoccoli Sr. and his wife, Augusta, both Italian immigrants, along with their daughter Nelli and her husband Lloyd Sherman, formed a partnership and bought a small grocery store. 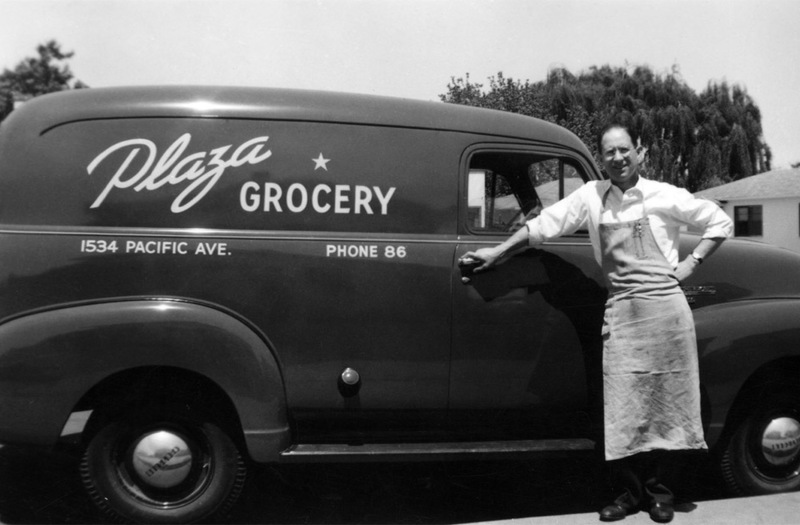 The Plaza Grocery, a Red & White Food Store, was located in downtown Santa Cruz where Zoccoli's Deli resides now. It was a very diversified operation that sold everything from household supplies to deli meats and cheeses, many of which we still carry today. Sandwiches! The early 70's was when the store decided to start making a few sandwiches. Nelli and Ann began experimenting with deli salads and soups, which are still the same recipes used today. In 1977, Lloyd and Nelli sold their interest to Tom Mills and his wife Sharon, who is Bob's niece. The store's name was then changed to Zoccoli's Deli after the family name. In December of 1955, downtown Santa Cruz was flooded. The back door on Front Street had 2 feet of water pushing against it. The back door was carefully sandbagged which only allowed about 2 inches of water on the main floor; however, the basement was flooded with 2 1/2 feet of standing water. A great deal of merchandise was destroyed. Robert Zoccoli Jr. was in the Navy and was granted leave to assist the family during this difficult time. The store was able to remain open during the clean-up to service their customers. The deli business was booming! The store was completely remodeled, with the addition of a full kitchen, in order to service the customers more efficiently. In April of 1989, Tom and Sharon sold their interest to Craig and Russell Zoccoli, Bob and Ann's sons. All was well until October 17, 1989. The devastating Loma Prieta Earthquake destroyed most of downtown Santa Cruz. For the first time since 1948, Zoccoli's doors were closed. A month later, operating out of a 10'X30' trailer, we were one of the first businesses to temporarily relocate and service customers downtown. In 1962, Robert Sr. and Augusta, turned their interest of the store over to Robert Jr, (Bob) and his wife Ann. In the late 60's the store was renamed The Plaza Mediterranean. It wasn't until 18 months later that our customers were able to walk through the same doors as they had prior to the earthquake. Our customers faithfully supported us as the new downtown was being rebuilt around us. Bob and Ann have retired, turning the store over to their sons, Russell, who runs the kitchen and Craig, who oversees the daily operations of the main floor. Craig's wife, Patty assists in running the daily operations of the deli. The Zoccoli Family, now in its third generation, is proud to continue operating one of the oldest family run businesses in Santa Cruz.